Feel confident. Holiday: the perfect timeless tunic you’ll reach for again and again. Say hello to your new spring staple. 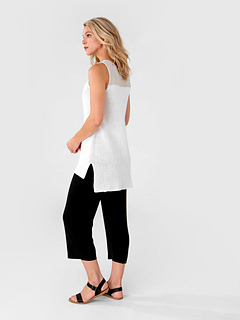 Holiday features a high-low hem and color blocked yoke with optional sleeves. The vented front and back flaps are knit flat, then joined and knit in the round to the armholes. 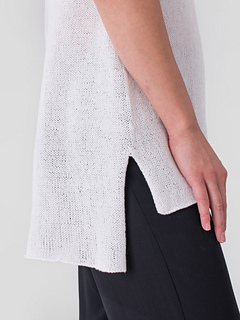 There are two armhole options: a sleeveless Shell or short sleeves for the Tee. 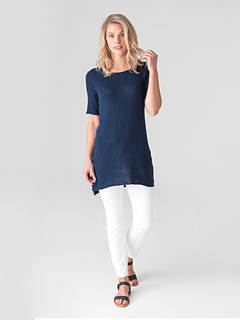 Sleeveless Shell features a color contrast finish at the armhole, while short sleeves are knit flat in the contrast color, then set in and seamed. Holiday can be knit in one color if desired. Instructions are for color blocked garment. For one color garment, use the same color throughout.